Next month Agnes Nixon fans can finally read the memoir Agnes Nixon was working on when she died last fall. 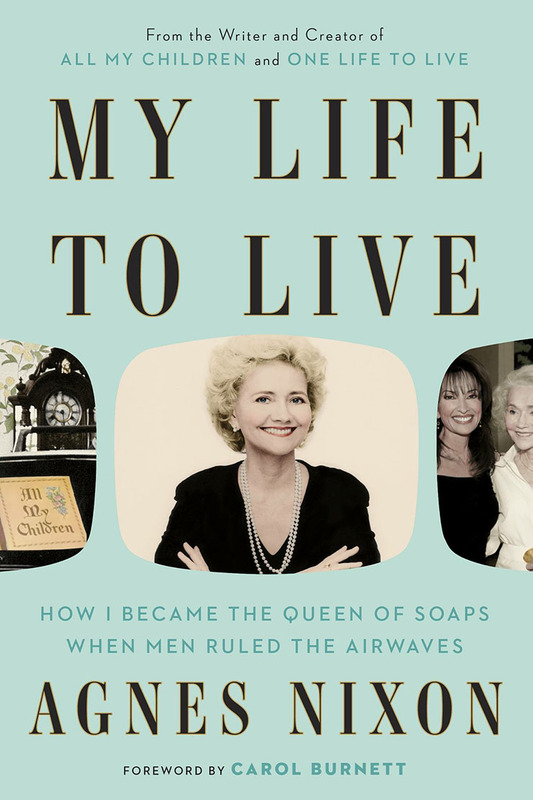 Nixon’s memoir, My Life to Live: How I Became the Queen of Soaps When Men Ruled the Airwaves, will be out on March 21st, according to Nixon’s Facebook page. Eager fans can pre-order a copy today, however. It includes a foreword by “All My Children” mega-fan and TV legend in her own right, Carol Burnett. Nixon then branched out on her own, creating three more daytime classics and serving as head writer on them. Those soaps were, in order of their creation, “One Life to Live” (OLTL) “All My Children” (AMC), and “Loving.” Soap Cities has written of the fight to bring back AMC and OLTL to our screens. Nixon honed her soap writing skills under the grandmother of the genre, Irna Phillips. Nixon changed the landscape of American television through her innovative writing. She often expressed a deep love for humanity and a faith in the essential goodness of all people. This showed through in her compassionate portrayal of the characters she wrote for and those she created. She championed the “issue storyline” in soaps, brining many progressive cultural issues to the attention of mainstream America such as veteran’s issues, LGBTQ rights, eating disorders, among many others. Nixon also showed a masterful command of the cliffhanger, an essential part of serial storytelling. That she could do so is evidence of her empathy for the struggles of humanity. In order to execute a cliffhanger well, you must understand that it involves viewers caring what happens to characters when the cliffhanger is picked up. A Must-Read for Any Soap Fan–Especially AMC and OLTL Fans! Soap fans, indeed all television fans, will no doubt find My Life to Live riveting reading. As a towering figure in the daytime serial industry, Nixon’s take on its evolution over her multi-decade career is sure to be instructive, enlightening, and soapily entertaining. “We hope you will share in our excitement and help to make it a bestseller sure to get the attention of the networks and spark the return of her shows!” Nixon’s family said in a statement. Give us your input in the comment section below. Check back with Soap Cities for more AMC/OLTL news, updates, fun, and more! Follow us on Twitter at @soapcities, on Instagram at @soapcities, and come chat with us in our Facebook group. “All My Children” and “One Life to Live” will one day be back on-screen—never doubt!